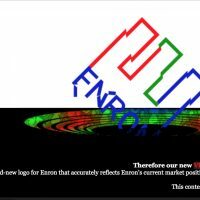 Enron Designed Fake Trading Floor – Former Employee Claims No Trades Transpired. ( via Tom Tomorrow ) See also: The Sting, The Grifters. Amazing and appalling behavior. The lesson? The bigger the lie, the more likely it will be believed. At Slate, The Enron Blame Game (requires Flash) [link directly to popup]. Taking responsibility? No thanks, I’ll blame someone else.